March 8th, Joshuah Bearman and Adam Cushman! Joshuah Bearman has written about CIA missions, aspiring Fabios, and the world’s greatest Pac Man player. He has covered Presidential elections and also blew the lid off the story of the great rodent disaster of 2003, when giant gerbils invaded inland China. Joshuah has written for Harpers, McSweeneys, Wired, Rolling Stone, and contributes to This American Life. Adam Cuhsman’s stories have appeared or are forthcoming in approximately twenty-three journals, including The Mississippi Review, The St. Petersburg Review and Pindeldyboz. He teaches creative writing at UCLA Extension and Cal State. He co-wrote the upcoming feature film The Prophet, starring Michael Madsen and Eric Roberts, and is currently developing a TV series about the descendants of our forefathers. Thanks to all of you who came out for the February Book Party. It was a huge success. We had a packed house and heard some amazing work. Thanks to Mandrake and DJ Scotch Tape, and of course, a big thank you to Aimee Bender and Marlys West for coming out and reading incredible new work. We laughed, we cried, we were extremely grateful that our faces were not too symmetrical and that no one had to hit us to make us look trustworthy. Joshuah Bearman and Adam Cushman will be reading on March 8th, and we can’t wait. More to come, and soon. It’s February, and it might be tempting to put your head in the oven rather than face another day, but resist, dear reader! Relief is on the way! Come on over to the Mandrake on Sunday, February 8th at 7:00 p.m. and feel the literary love. Book Party has oh so much to give. I mean, how could you possible resist. . . The drink special, the sophisticated Negroni, was created by an Italian Count. This is a serious drink for serious times. Except it’s red! All the way from NYC. . . the musical stylings of DJ Scotch Tape. Heart shaped cookies. They will soothe your existential suffering and make you feel five again. And of course, the reason Book Party exists. . . real! live! writers! Come hear new work read by two incredible Los Angeles writers, Marlys West and Aimee Bender! So stop in, listen to something new, and enjoy yourself. We promise, it will beat a February night at home in the kitchen. Drinks and Books. Sylvia approves. We’re thrilled to announce that Marlys West and Aimee Bender will be joining us on Sunday, February 8th. Marlys West is an award-winning poet and writer living in Los Angeles. She was a Hodder Fellow at Princeton University, an NEA grant recipient in poetry, and received her M.F.A. from the Michener Center for Writers. The University of Akron Press published her book of poems, Notes for a Late-Blooming Martyr, in 1999. She is currently working on a new collection of poems and finishing her first novel. Aimee Bender is the author of three books: The Girl in the Flammable Skirt (1998) which was a NY Times Notable Book, An Invisible Sign of My Own (2000) which was an L.A. Times pick of the year, and Willful Creatures (2005) which was nominated by The Believer as one of the best books of the year. Her short fiction has been published in Granta, GQ, Harper’s, Tin House, McSweeney’s, The Paris Review, and many more, as well as heard on PRI’s This American Life and Selected Shorts. She’s received two Pushcart prizes, and was nominated for the TipTree award in 2005. Thanks for coming out to the December Book Party! It was a night of beauty and mischief, as our writers explored everything from genital piercing to the transcendence of death and somehow even made student allergies alarmingly funny. Thanks so much to Brendan Constantine and Rob Roberge for making us laugh and making us cry. And thanks to you all, for coming and supporting new literature on a chilly Sunday night. We’ll be back in 2009 on January 11th. In the meantime, I am the President of Monaco. In case of emergency, call a jeweler. Brendan Constantine was born in Los Angeles and grew up there with his sister, the children of two working actors. His parents placed great value on the arts, going so far as to name him for Irish playwright Brendan Behan. Before pursuing his MFA degree at Vermont College of Fine Arts, Constantine had already toured the US and Europe, published extensively and been finalist for the National Poetry Series, The Philip Levine Prize and the A. Poulin Prize. His work has appeared in numerous journals, most notably Ninth Letter, Ploughshares, The Los Angeles Review and RUNES. His collection Letters To Guns will be released in February 2009 from Red Hen Press and is heralded as “the most anticipated first book from a Los Angeles author since The Big Sleep.” He is the creator of Industrial Poetry, a workshop for adults and teens struggling with writer’s block, and is currently poet in residence at the Windward School in west Los Angeles and the Idyllwild Arts Summer Youth Writing program in Idyllwild California. A regular participant in both the Los Angeles and Orange County Poetry Festivals, Brendan has enjoyed an active role in southern California’s poetry communities. He is a three time finalist for the National Poetry Series and in 2002 was nominated by the Poetry Super Highway for poet laureate of the state of California. You’re Invited to Book Party! Sarah Shun-lien Bynum is the author of two novels, Ms. Hempel Chronicles and Madeleine Is Sleeping, which was a finalist for the National Book Award in 2004 and winner of the Kafka Prize. Her work has appeared in several magazines and anthologies, including the New Yorker, Tin House, the Georgia Review, and the Best American Short Stories. 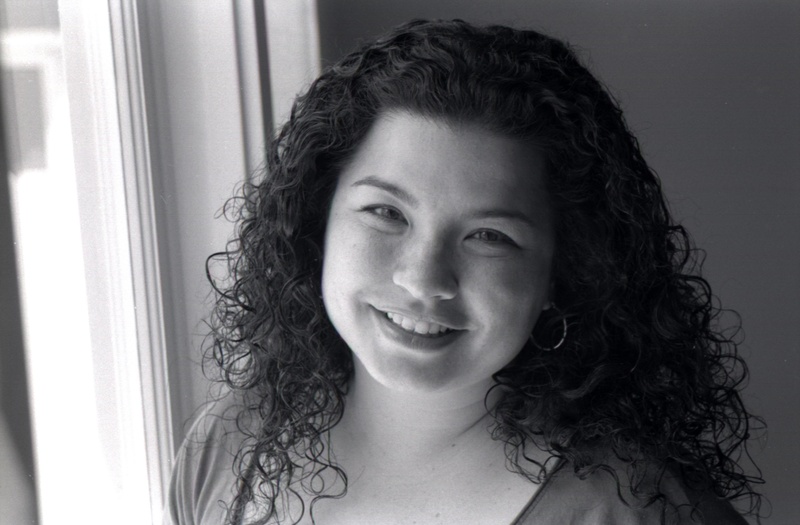 The recipient of a Whiting Writers’ Award and an NEA Fellowship, she teaches writing and literature at the University of California, San Diego. She lives in Los Angeles with her family. Theresa Sotto lives and writes in Santa Monica, California. She is a recent recipient of the Poetry Society of America’s George Bogin Memorial Award, and her poems have been published in POOL, No Tell Motel, Spinning Jenny, Shampoo, Typo, Word For/Word, and others. Theresa is the author of excerpts from a fair, a chapbook published in the journal Achiote Seeds (Fall 2007), and hinge, forthcoming in the Coconut Chapbook Series. 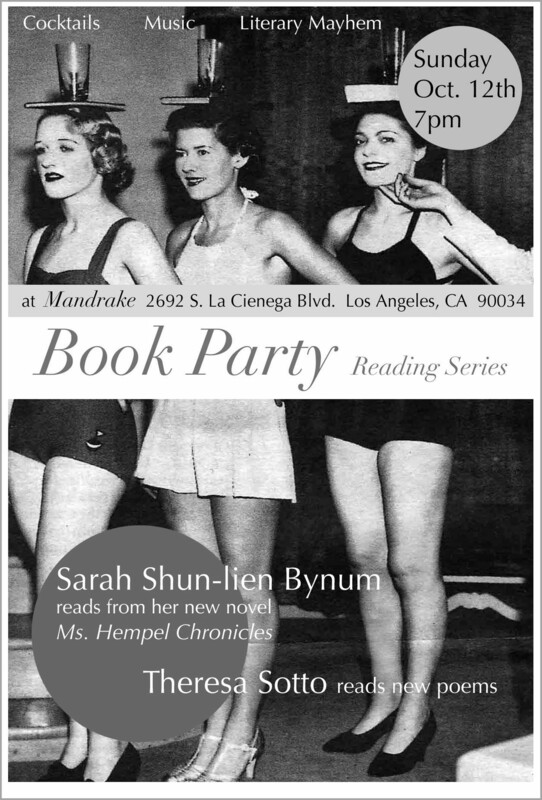 Please join us at the Mandrake for the debut of Book Party, featuring National Book Award Finalist Sarah Shun-lien Bynum, reading from her new novel the Ms. Hempel Chronicles and Los Angeles poet Theresa Sotto, reading new work. This event showcases writers in an informal, lively setting with a DJ spinning music related to the evenings stories and poems, plenty of cocktails and occasional activities, bringing the audience in for a collective literary experience.